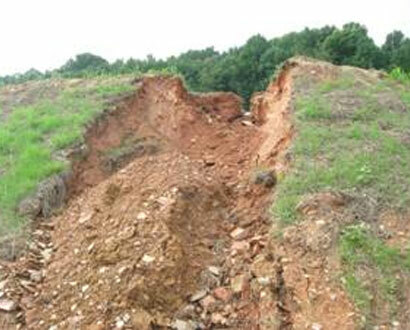 Erosion is a natural process by which the surface of the land is worn away by water, wind or chemical action. Accelerated erosion is the removal of the surface of the land through the combined action of human activities and natural processes at a rate greater than would occur from natural processes alone. Is sediment really a pollutant? A certain amount of erosion and sediment occurs naturally. Because it is a natural process, nature is able to assimilate naturally occurring sediments without permanent adverse effects. 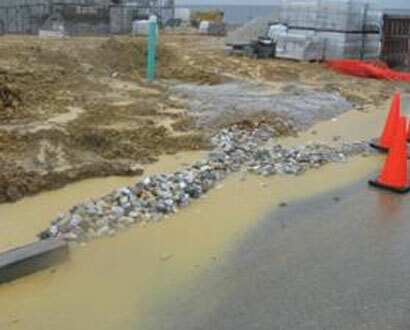 Adverse effects most often result from accelerated erosion due to earth disturbance activities such as surface mining, agricultural plowing and tilling, construction and timber harvesting operations. Raise the levels of streams, lakes, etc. and increase flooding. Decrease oxygen in the waters, suffocating fish and other aquatic life. Deposit sediment over the breeding beds (eggs) of aquatic life.